It has been a while since I have pointed out a milestone for us here at Vikings gab, or for myself personally. It isn’t that we haven’t had them, I just neglected to toot my own horn, which I must say is highly unusual for this particular hack blogger. First, I have to give a HUGE thank you to Branden, Randy, and Matt. These guys are awesome to work with and the opening day of free agency this year ended up seeing our single day traffic record crushed into oblivion thanks mostly to the awesome job they all did of feeding us with up-to-the-minute updates on the fast paced news and rumors that were flying about. Second, the post below this one was article number 2,000 for yours truly. While only about three of the 2,000 posts are worth the pixels they are written on, this has been a fun mountain to climb. In all honesty, more than anything, I just wanted to say thanks to everyone that visits this site. This is the most fulfilling hobby I have ever had (okay, fine, fishing beats it out just barely) and that is 100% due to the awesome readers we have at this site. So, whatever reason you have for giving us a click from time to time, this hack blogger says “THANK YOU” to each and every one of you. Congratulations Adam! Keep up the good work. Thank You Adam for keeping together such a great site!! It’s always fun here! Thanks for the good work! That’s a BUNCH of posts. Not the token kind like we had in the final days of the AV, either. Congrats! This site is awesome! 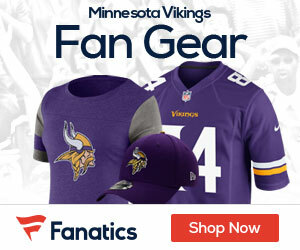 I have been checking it daily to keep updated on Vikings transitions and training camp and this site is always the first place I find something out. Awesome job to everyone that has put work into this site. Keep up the good work and GO Vikings!!! Thanks Adam for all you hard work ~ !!!!!!!!!!!!!! Thanks again, Adam and the other guys who contribute to this site. It’s a great site and I always look forward to reading the insightful articles about the team. Not only that, it has a great group of readers and devoid of the idiots you get on nfl.com and espn. Keep up the good work. Devoid of the idiots? Devoid of idiots? This is a Viking team site. Of course we’re idiots to hang out here the way we do. If we weren’t here we’d probably be out doing something PRODUCTIVE like the Chinese. Devoid of idiots. I’m not sure you’ve thoroughly read through all of Adam’s 2000 posts. And he’s the one in charge. Lost, the ‘idiots’ that i’m referring to are the ones that are on most sports blogs, those whose sole purpose is to go on abusive rants against anyone who has a slightly different view of things. I have been reading this site for a couple of years and try to read all articles and comments and I can barely recall encountering this type, which is a nice change. But yes, in some regard I guess we are ‘idiots’ for spending so much time on here and not doing more productive things. Thanks for so many nice blogs entries.